S6 acts and feels like a physical extension of your software, providing a truly intuitive and immersive experience. Turn around projects faster with high precision editing and mixing control at your fingertips. 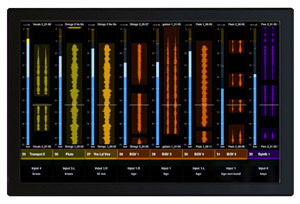 Quickly access and edit plug-ins, surround panning, and more with the multipoint touchscreen. And see every detail of your mix with unprecedented visual feedback, including waveform scrolling. Experience the deep DAW control that only Avid can deliver. 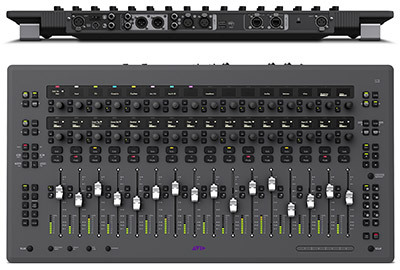 Pair S6 with Pro Tools and you gain the Avid advantage of faster workflows, extended visual feedback, and unique features to accelerate your efficiency every step of the way. And extend your control to Logic Pro, Nuendo, and other EUCON™-enabled DAWs, enabling you to mix projects on multiple workstations simultaneously and switch out sessions in seconds—all from a single control surface. S6 delivers incredible workflow acceleration, highly responsive handling and deep DAW integration—all built on proven technology, trusted by top audio professionals in the most demanding production environments. The result: you get the exceptional, dynamic performance you need to deliver your best sounding mix possible—on time, every time. Master modules are the central hubs of your S6 surface. All surfaces must include a main engine, which provides touchscreen access and control, and you have a choice between two—S6 M40 or S6 M10. The S6 Automation Module complements both, providing controls for transport, automation and more. Here’s a closer look at these modules. The engine you choose dictates the total number of modules you can include in your S6 and impacts its overall size and customizability. Choose the high-performance M40 for large-scale productions that require maximum channels, high-resolution metering screens, and customizability, or the more affordable M10 for productions that need to fit into smaller rooms and budgets. 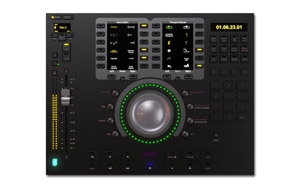 Both feature a tilting 12.1-inch multipoint touchscreen, eight adjacent rotary encoders, and dedicated knobs and keys for monitoring and global control, enabling you to view, access and edit different aspects of your mix—such as tracks, processing and metering—without mousing through menus. This master module is included in all pre-configured systems, but is an optional add when building your own S6 M40-based surface (though you’d probably want one). It features a full transport control section (including a shuttle/jog wheel), focus fader, automation control, color shortcut displays and switches, a numeric keypad, and more for writing automation and navigating projects. 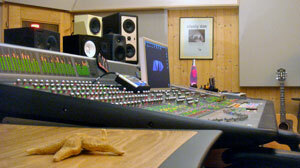 Like S6, S3 delivers intelligent control over every aspect of Pro Tools and other DAWs, but at a more affordable price. While its small form factor makes it ideal for space-confined or on-the-go music and post mixing, it packs enormous power and accelerated mixing efficiency for faster turnarounds, making it the perfect fit everywhere, from project studios to the largest, most demanding facilities. – Works with Pro Tools and Pro Tools HD 11.2.1, Media Composer 8.1, Logic Pro X, Cubase 7 and Nuendo 6.5. Resolve 11 and Pyramix 9 support coming soon. controller, the System 5-MC mixing control surface tightly integrates with multiple DAWs, enabling you to take deep, hands-on control of EUCON-enabled apps over the high-speed EUCON Ethernet control protocol. The compact and ergonomic MC Pro control surface enables you to speed up your post or music editing and take deep hands-on control of Pro Tools, Logic Pro, Nuendo, and other EUCON-enabled applications. What’s more, the surface automatically detects your current application (when working with multiple apps) and resets all controls to match. And with its programmable SmartSwitches, you can perform complex tasks/keystrokes with a single button press. – Get instant, customizable pushbutton access to hundreds of commands. – This enables you to quickly switch between multiple applications and even workstations at the touch of a button, with all controls and displays automatically matching the selected application. The flagship ICON tactile worksurface, D-Control ES combines the feel of a large-format console with a level of control and added Pro Tools functionality that can only be accessed with an ICON system. D-Control ES includes a comprehensive array of touch sensitive controls and offers a wide range of visual mixing feedback. 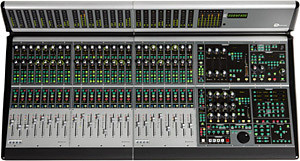 With a dedicated center section for most-used controls to stay in the sweet spot, per-channel control over all processing functions and routing, global automation capabilities, and full studio and control room monitoring and communications facilities, D-Control ES arms operators with an unprecedented level of hands-on control over their projects. 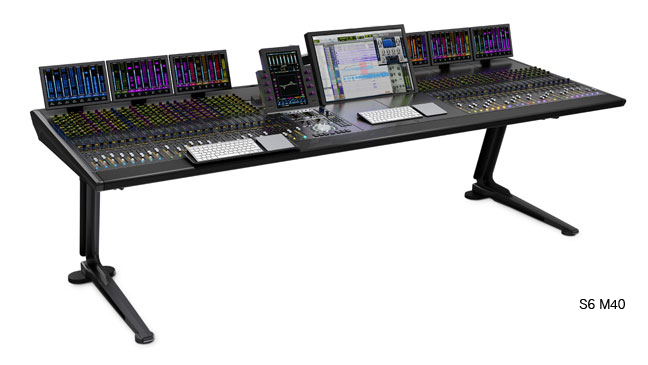 The D-Control ES worksurface employs an intuitive console layout. The worksurface is expandable to 80 physical faders/channels strips by adding 16-channel Fader Modules. D-Control ES’s ergonomic design enables full control from the channel strips with minimal paging, while its wealth of LCD displays, LED rings, and bar graphs facilitate critical visual session feedback. D-Command ES, the mid-size controller of the ICON family, packs amazing control and ICON-exclusive Pro Tools functionality into a compact work surface. 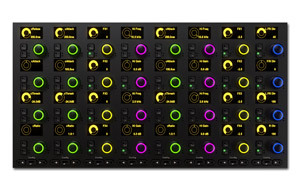 Featuring dedicated, center section panels for EQ and dynamics plug-in editing, as well as per-channel control over many processing functions, routing, and automation modes, D-Command ES provides operators powerful hands-on command over their projects – also for a studio with limited space. 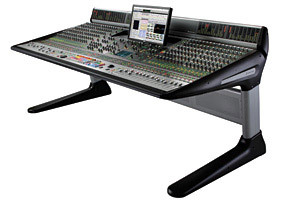 Similar to D-Control ES, the D-Command ES worksurface employs an intuitive console layout. 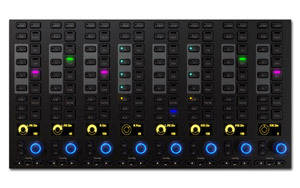 The D-Command ES Main Unit features an easily accessible, central control section with monitoring and communications controls, and includes eight channel faders, which are expandable up to 24 faders with a 16-channel Fader Module. D-Command ES’s ergonomic design enables control of multiple session parameters via the channel strips and provides LCD displays, LED rings, and bar-graph meters to facilitate important visual session feedback. Like it’s larger sibling, D-Command ES supports revolutionary Custom Faders, enabling free mapping of channels, plug-in parameters etc. on touch-sensitive rotary controllers and faders. Already Custom Faders alone gives the operator a massive speed advantage over other controllers not in the ICON class. 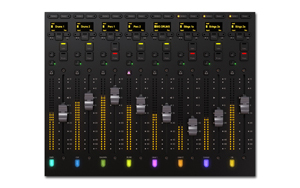 Sleek and stylish, the 24-channel C|24 control surface provides direct hands-on control of Pro Tools and Pro Tools|HD mixing, recording, and editing; a complete array of high-quality analog inputs; and a 5.1 analog monitor section to use with your Pro Tools I/O. 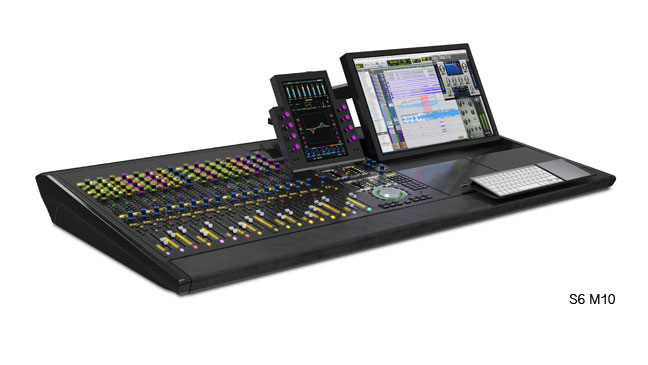 It tightly integrates with the latest advancements in Pro Tools software to provide an incredibly powerful and richly featured console option.